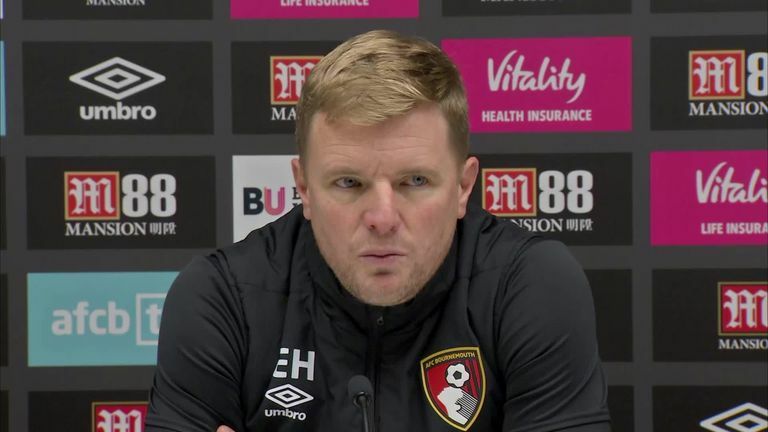 Bournemouth manager Eddie Howe has revealed new signing Dominic Solanke could be out until February with a hamstring injury. Solanke joined the Cherries in a £19m move from Liverpool on Friday but was not included in the squad that lost 3-1 to Brighton in the FA Cup on Saturday. Howe has confirmed Solanke was carrying the injury when he signed from Liverpool and expects the 21-year-old to make his debut next month. "He's got a hamstring problem at the moment so he'll probably miss most of January," said Howe. "We are probably looking more at February." Howe insists he is not concerned about the severity of the injury. "We've done the relevant tests, he's had a thorough medical," said Howe. "It's a minor hamstring problem." Solanke scored just one goal in 27 appearances for Liverpool after joining the club on a free transfer from Chelsea in 2017. However, Howe believes the England international has enough quality to become a regular goalscorer in the Premier League. "He will bring a slightly different dynamic to our front line," said Howe. "He's got the ability to hold the ball up, link the ball up and link play. "He's technically very gifted, very good in the air from crosses which is something we will certainly utilise. "And he's a good physical presence with the ability to move so I think all round he's a very good player."